The brainchild of billionaire entrepreneur Elon Musk, this revolutionary train is able to transport passengers at extremely fast distances. It is only in the design stage yet has already achieved a significant amount of buzz. The train is able to reach speeds of 800 miles per hour. If a delivery company were to use it to transport their goods then they would have a massive edge over competing entities. For instance, if they wanted to deliver a package from San Francisco to Los Angeles the shipping time would be around 30 minutes. This would make same-day delivery a common thing in the industry. These trains use magnetic forces to move a train at an incredible speed. They would be able to reach over 300 miles per hour. This is not as impressive as the Hyperloop but the reality of the project actually coming off the ground is much more possible. There is already heavy investment in the Asian market for this kind of technology. The desire to see the train come to fruition is mostly due to rising fossil fuel prices. The Maglev is extremely energy efficient and does not rely on expensive fuels. The main issue holding back the full development of the project is the unfortunate high costs associated with of its completion. However, if more investment does come to it then it is well worth transportation companies to look to it as the future of delivery methods. 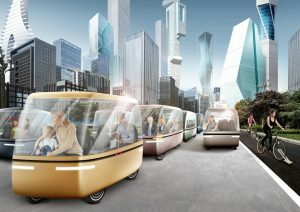 Driver-less cars are already becoming a reality. The hardware exists, it is only a matter of time before both legislation and navigational software advances to the point where we see them everyday on our roads. When it does it seems logical that they well be used as the dominant method of transporting goods and packages.